Dr Sarah Furness was appointed by the Queen as Her Majesty’s Lord-Lieutenant of the County of Rutland in March 2018. 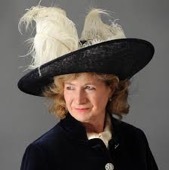 Sarah is a philosopher and ethicist who recently served the County of Rutland as High Sheriff. She has worked for many years in the voluntary sector, including for Macmillan Cancer Support for Rutland, supporting those with life-limiting illnesses and Warning Zone, a life-skills centre and children safeguarding charity, which introduces children to the dangers of modern life. Sarah is a member of the steering committee for Women in Philanthropy, which supports charities across Rutland and Leicestershire; a trustee for the Sustainable Land Trust, supporting those at risk of being expelled from school; and a trustee for Rutland Grants, helping local people in need. She is also a member of the Court of Leicester University. Sarah lives in Whissendine with her husband, Peter, a former President of the Royal College of Pathologists. They have an adult daughter.